The hallmark that sets the LDS Church apart from all other religions is its claim that God’s authority has been restored on Earth through the Prophet Joseph Smith. LDS historians suggest that the restoration occurred sometime in May 1829 in an unknown location near Joseph Smith’s home in Harmony, Pennsylvania. Joseph and his scribe Oliver Cowdery claimed that they were in the midst of prayer when they were visited by a heavenly messenger, John the Baptist, who conferred upon them the Priesthood of Aaron. Joseph and Oliver then claimed that a second visitation soon occurred in a separate location, this time by the ancient apostles Peter, James, and John, where the higher priesthood, or Melchizedek Priesthood, was also conferred upon them. Similar to Joseph’s first vision, the restoration of God’s authority passed without mention for years. The event remains documented in just a few sentences of altered scripture, the totality of which was inserted years later into previously canonized LDS scripture. This seminal event lacks any customary corroborating support – such as scribe notes, journal entries, press materials, first or second-hand accounts. The alteration of revelation remains the only supporting documentation which speaks to the visit of John the Baptist, Peter, James and John. The belated introduction of the restoration narrative occurred during an intensely challenging period in Kirtland, Ohio. Not only was Joseph Smith’s sole authority being questioned, he also faced accusations of adultery. The timing and manner of the introduction of Joseph Smith’s authority claim, coupled with irrefutable evidence of the scriptural alterations supporting it, remains the greatest challenge to the Church’s claim of unique and superior authority. Even Richard Bushman, esteemed LDS historian, observed that “the late appearance of these accounts raises the possibility of later fabrication” (Rough Stone Rolling, 75). The Book of Commandments (BoC), which contained a compilation of significant early revelations, was printed in 1833 with very limited distribution before the printing press was destroyed by opponents of Mormonism. This canonized publication remains the baseline against which latter alterations are compared. The Book of Commandments was expanded and revised in 1835 to become the Doctrine & Covenants (D&C). In the revised edition, D&C Section 27 was expanded to include over 400 additional words. The expansion which delivered Joseph’s new and unique authority claims was the very first mention of John the Baptist, Peter, James and John’s visitation. Prior to the publication of the D&C, the miraculous priesthood restoration was unknown within the Church. A prominent historian of Mormonism, Dan Vogel, observed, “Indeed, there was nothing thus far in the Book of Mormon to cause Smith and Cowdery to seek angelic ordination. Alma received authority to baptize through the Spirit (Mosiah 18:13). Similarly, Alma II taught that holders of the high priesthood were preordained to their office (Alma 13:3), and Jesus’ commission to Nephi and other disciples seem to have been conveyed verbally (3 Nephi 11:21). In this setting, the subsequent claim to angelic ordination seems anachronistic” (Joseph Smith, The Making of a Prophet, 307). The Church is in possession of Wilford Woodruff’s original, signed Book of Commandments, yet for many decades refused to make the contents public. Upon learning that the Tanners, prominent Mormon history researchers, had secured the first 41 pages, the Church expressly forbade BYU from allowing them additional access. Like Joseph’s original 1832 first vision account, which was kept from public examination for decades, the Tanners were responsible for educating LDS members about these significant alterations. Most scholars concede that the restoration text was created in 1834-5 by Joseph and Oliver. Joseph’s credibility and authority were particularly threatened, as multiple church leaders purported to be in direct communication with the Lord as new Prophets or Prophetesses. Joseph’s delivery of the restoration and visitation narratives secured his role as the lone Prophet and discredited his rivals. Side-by-Side Comparison – Chapter 28 in the 1833 Book of Commandments can be compared to the significantly expanded, renumbered D&C Chapter 27. David Whitmer, one of the three witnesses of the golden plates and founding member of the Church, confirmed, “I never heard that an Angel had ordained Joseph and Oliver to the Aaronic Priesthood until the year 1834, 5 or 6… I do not believe that John the Baptist ever ordained Joseph and Oliver…” (Zenas Gurley Jr., Questions asked of David Whitmer at his home in Richmond, MO, Jan 14, 1885 / EMD 5:137). “I see that some of you claim that the same power which gave these revelations, had authority to change them, and refer to Jeremiah 36:32. By reading this passage you will see that the words which were added were “like words;” words which conveyed the same meaning — were added to that book by Jeremiah when he was writing it over again, because it had been burned in the fire by the king. But the words added to the two former revelations are not “like words,” as they change and reverse the original meaning” (An Address To All Believers in Christ, Whitmer). Lucy Mack Smith’s (Joseph’s mother) 1831 letter to her brother defending the Church lacks any mention of any angel or authority restoration. Joseph Knight, in 1833, wrote a history of important events in Mormonism up to that year, yet makes no reference to either John Baptist or Peter, James, John. This omission is very significant because his history is the only LDS source for details of angel Moroni’s annual visits with the Smith from 1823 to 1827. William McLellin shared, “As to the story of John the Baptist ordaining Joseph and Oliver on the day they were baptized; I never heard of it in the church for years, altho I carefully noticed things that were said.”(McLellin to Joseph Smith III, July 1872) William’s story remained consistent, reporting years later, “I joined the church in 1831. For years I never heard of John the Baptist ordaining Joseph and Oliver. I heard not of James, Peter, and John doing so… (McLellin to J.L. Traughber, Aug 25, 1877). B.H. 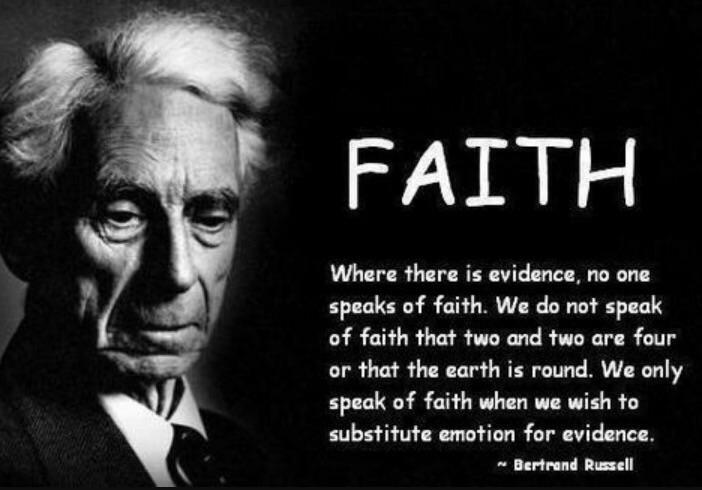 Roberts wrote, “There is no definite account of the event in the history of the Prophet Joseph, or, for matter of that, in any of our annals… This lack of historical proof will not alter belief in the divine commission. These matters are to be accepted by faith.” (History of the Church, 1:40. Paragraphs believed to substantiate the priesthood restoration in D&C 18:9; 20:2, 3 ; 27:12; 128:20 are cited). Joseph F. Smith and Orson Hyde asked David Whitmer “Can you tell the date of the restoration of the Apostleship by Peter, James, and John?” He replied: “I do not know, Joseph never told me. I can only tell you what I know: I will not testify to anything I do not know” (Cook, David Whitmer Interviews, 25). In Biblical times, priesthood wasn’t spoken of as an abstract principle independent of priests. Priesthood was simply a state or quality of being a priest. It wasn’t receiving the priesthood that made one a priest, but rather being made a priest gave one priesthood – just as being dubbed a knight gives one knighthood. The New Testament doesn’t explicitly state that the priesthood was given to any of Christ’s disciples (This is My Doctrine, 373-6). The LDS Church today teaches that there are two priesthoods: Aaronic and Melchizedek. The word “priesthood” is often used for an array of overlapping but subtly distinct concepts, such as priesthood power, priesthood authority, priesthood keys, priesthood offices, priesthood blessings, priesthood leaders, priesthood quorums, and priesthood ordinances. In the modern LDS church, priesthood is everywhere, and always patriarchal. Additionally, the narrative itself, composed beginning in 1838, necessarily reflects the perspective of Joseph Smith and his collaborators at the time of its production, thus inadvertently introducing terminology and concepts that were not operative a decade earlier in the period the narrative describes. Examples include using later priesthood nomenclature such as “Aaronic” and “Melchizedek” and calling the church Smith established “the Church of Jesus Christ of Latter Day Saints,” a name not designated until 1838. Such usage makes it difficult to trace the details of the unfolding of church governance and doctrine in the faith’s dynamic early years. The timeline below outlines relevant events and revelations surrounding the restoration of the priesthood. In hopes of avoiding anachronisms, it lists documents and events in the order that they appear in the historical record, rather than in the order of the modern restoration narrative. The priesthood restoration was incremental and its true history contains significant challenges. This timeline shows the evolution of a number of ideas surrounding authority and priesthood. Mar 26, 1830 The Book of Mormon is published. It sometimes uses the term “high priest” to describe the top religious official in a region, but other times refers to groups of “high priests” together.6 It uses the word “priesthood” in two chapters (Alma 4 and Alma 13), always referring to it as the “high priesthood”, and sometimes expanding it with variations of “high priesthood according to the holy order of God”.7 Alma 13 describes Melchizedek as a high priest but does not identify an order of the priesthood as bearing his name.8 The book describes a number of people baptizing, leading churches, serving missions, or speaking for God with no record of them receiving power or authority to do so from a priesthood holder. These include Lehi, Nephi, Alma, Samuel the Lamanite, and others. Near the end of the book, Moroni speaks of elders ordaining teachers and priests by the laying on of hands.11 The Book of Mormon makes no mention of a lower priesthood associated with Aaron. Apr 1830 The Church of Christ is founded by Joseph Smith. Joseph dictates a revelation titled The Articles and Covenants of the church of Christ, which lays out the offices of elder, priest, teacher, and deacon.12 The revelation does not use the words “priesthood”, “Melchizedek”, or “Aaronic”, or distinguish between a higher and lower order. This revelation would become chapter 24 of the Book of Commandments (BoC) and eventually section 20 of today’s Doctrine and Covenants (D&C). Aug 1830 The Church claims D&C 27 was received this month. June 3, 1831 At a conference of church leaders in Kirtland, Joseph is ordained to the “high priesthood” by Lyman Wight. “The authority of the Melchizedek Priesthood was manifested and conferred for the first time upon several of the Elders.” (History of the Church, 1:175-76) .Over 20 other men are also ordained, most by Lyman but a few by Joseph. This is the earliest occurrence of the word “priesthood” in modern Mormon teachings or revelations.16 Joseph Smith’s own history, written years later, claims this as the first time. B.H.Roberts, as church historian, recognized the problem and inserted footnote denying the text. Note that the conference included evil spirits which threw one from his seat to the floor, bound another, inability to use limbs or speak. This revelation would later become a portion of section 107 of today’s Doctrine and Covenants. June 1832 The Evening and Morning Star, the Church’s first periodical, which often introduces revelations to members, yet no mention of the first vision or Peter, James, John. This revelation also introduces specific links between church offices and the two priesthoods. “[T]he offices of elder and bishop are necessary appendages belonging unto the high priesthood”, says the revelation, and “the offices of teacher and deacon are necessary appendages belonging to the lesser priesthood”. 1833 Book of Commandments published by W.W. Phelps, predecessor to D&C, Verse 28 is very important – no mention of Peter, James, John. 1833 Joseph Knight writes history of important events in Mormonism up to that year – no mention of either John Baptist or Peter, James, John. Nov 15, 1833 Mormonism Unvailed printed – first significant anti-Mormon book – no mention of First Vision, Peter, James, John. 1834 Oliver Cowdery writes Full History of the Rise of the Church of the Latter Day Saints. Such a comprehensive history of the early years should surely contain the details of multiple miraculous events, yet we find only the ecstatic account of ordination by an unidentified angel. If Joseph and Oliver then knew him to be John the Baptist they did not reveal it. There is no mention of two priesthoods, Aaronic or Melchizedek, lesser or higher, no promise of the Holy Ghost, no visit of Peter, James, and John (which in 1834 should have been a matter of historical record for five years), no mention of the baptism and ordination of each other, and finally, a different wording of the angelic conferment. Aug 17, 1835 Updated and heavily revised Doctrine & Covenants presented at conference, containing numerous unannounced changes and expansions to previously published revelations. PETER, JAMES, JOHN retroactively inserted into D&C 27 – FIRST TIME ANYBODY HEARS OF PRIESTHOOD RESTORATION. To the existing revelation on church offices (BoC 24, today’s D&C 20) is added a reference to the “high priesthood” and the offices of traveling bishop, high councilor, and high priest. This 1835 change to an 1830 revelation is the earliest mention of being ordained by resurrected biblical figures. 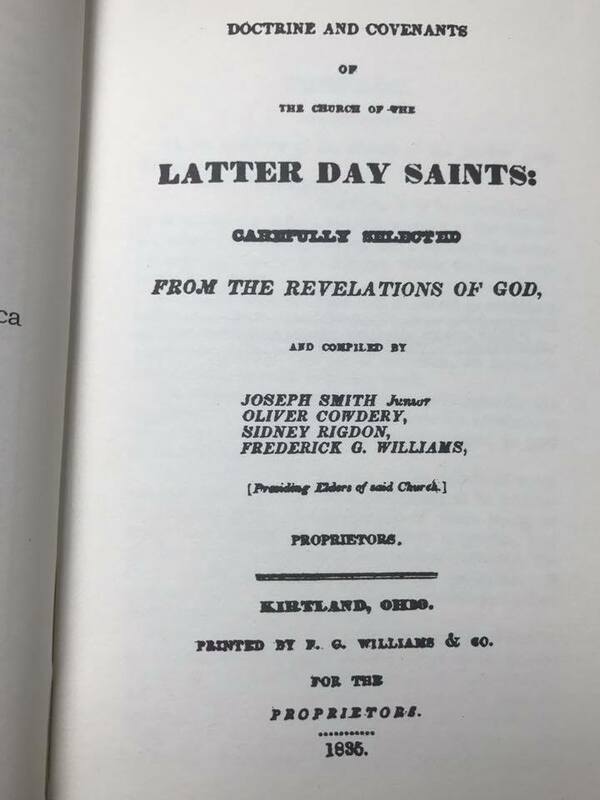 1835 Oliver Cowdery said, “[Smith] was ordained by the angel John, unto the lesser or Aaronic priesthood, in company with myself… After this we received the high and holy priesthood …” (Early Mormon Documents 2:452-453). 1842 In an epistle to the church, Joseph recounts hearing “The voice of Peter, James, and John in the wilderness between Harmony, Susquehanna county, and Colesville, Broome county, on the Susquehanna river, declaring themselves as possessing the keys of the kingdom, and of the dispensation of the fullness of times!” This letter comprises section 128 of today’s Doctrine and Covenants.28 It limits the possible locations of the Melchizedek priesthood ordination to an approximately 50 mile stretch of river between Colesville and Harmony. (The entire distance is more like 350 miles, but most of it does not run along the Susquehanna river). 1876 The words of John the Baptist from the 1839 priesthood restoration account are added to the Doctrine and Covenants as section 13. Joseph Smith and Oliver Cowdery claimed that Christ, Moses, Elias, and Elijah appeared to them in the Kirtland temple on April 3, 1836. (D&C 110) This visitation is credited as the moment additional priesthood keys were restored surrounding the LDS Temple Ceremony. According to Smith’s claims, The Savior appeared to accept the offering of the saints (D&C 110:3), Moses appeared to restore the keys of the gathering of Israel, Elias appeared to restore the blessing of the Abrahamic Covenant, and Elijah appeared to restore the temple sealing power. There are two significant challenges with this narrative. First, Smith apparently remained unaware that two of these seemingly different Biblical figures are in fact the same person; Elias is merely the Greek form of the Hebrew Elijah. He describes both figures as fulfilling Malachi’s prophecy regarding the return of the prophet Elijah. Thus, the two beings described separately by Smith in the context of Malachi’s prophecy would be the same person. Some Mormon scholars attempt to reconcile the dilemma with the notion that the name Elias has been applied to other men besides Elijah, such as Noah, John the Baptist and others. Or perhaps Smith’s Elias was merely a preparatory messenger who goes before one greater than himself. Such arguments rely upon incorrect Biblical and linguistic context, while avoiding the fact that Smith also clearly refers to two distinct Elias and Elijah prophets in D&C 27:6-9. The second problem with Smith’s Elijah narrative stems from a lacking doctrinal need for additional binding powers. Malachi 4:5-6 is interpreted by the LDS Church as the restoration of the sealing powers which enables families to be sealed together. Yet Malachi’s prophecy as it appears in the Old Testament gives no indication that Elijah would restore priesthood keys or reveal sealing ordinances either for the living or the dead. The New Testament interprets Elijah’s coming as having been fulfilled in John the Baptist. There is no mention of John exercising what Mormons understand as sealing powers. The view of a future coming of Elijah was refuted by traditional Christian theologians, who pointed to Christ’s own assertion that John the Baptist was Elias. Why Elijah’s authority would have been needed to make any ordinance binding is unclear, since Peter, James and John restored “the keys of the kingdom, which included the authority to “bind on earth” and “in heaven.” (Matt 16:9) Significantly, in all versions of Malachi’s prophecy revealed to Joseph Smith prior to 1838, there is no change in the wording from the King James Bible, nor is there any indication that Elijah would restore any sealing authority. This includes passages in the Book of Mormon, the D&C and even JST Malachi 4:4-5 (This is My Doctrine, 74-76). 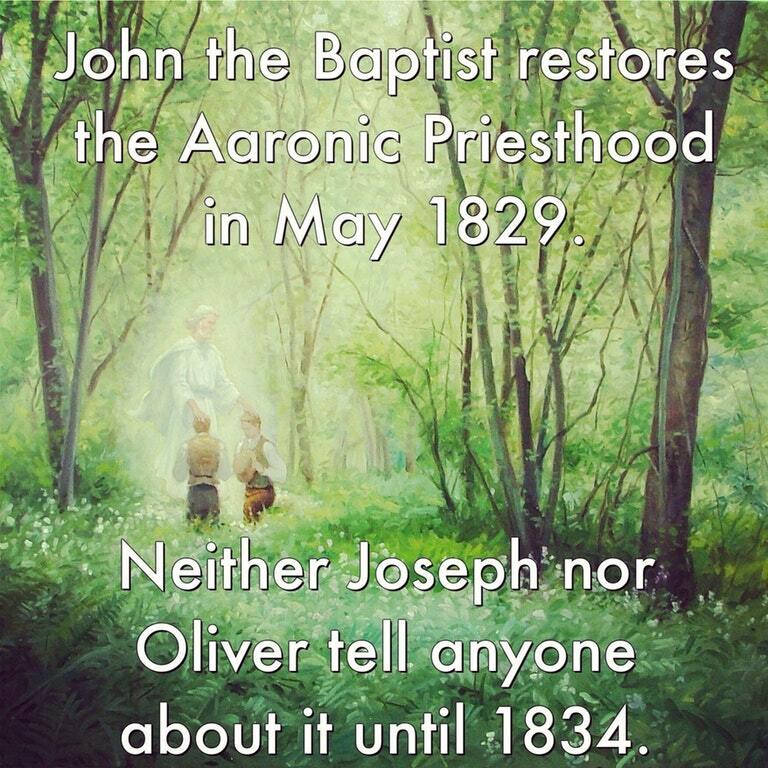 Pages 157-59 discuss how Joseph Smith was ordained to the high priesthood (Melchizedek Priesthood) for the “first time” one to two years AFTER Peter, James, and John were said to have bestowed the Melchizedek Priesthood on Joseph and Oliver.